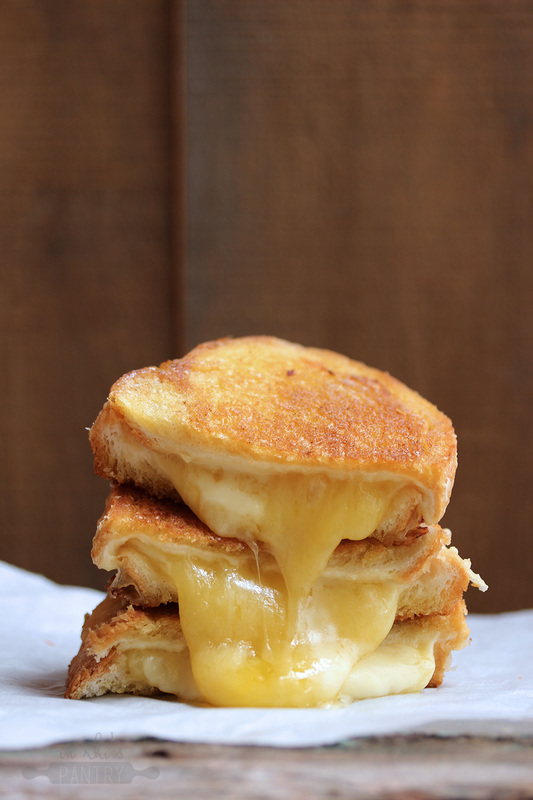 If you've seen the movie Chef, you will know immediately what I'm talking about when I mention THAT grilled cheese. When that beaut popped up on the screen, it felt like everything around me became still and my whole being melted into the seat I was perched on. If I close my eyes I can relive the point of the knife crunching through the crisp, buttery crust, and in slow motion Jon Favreau pulls the two halves apart to reveal a pool of lava like cheeses. I've never wanted to be Mike TV so much in my life and have the ability to jump into that screen as I did that day. So the next best thing - come up with a killer grilled cheese recipe myself. 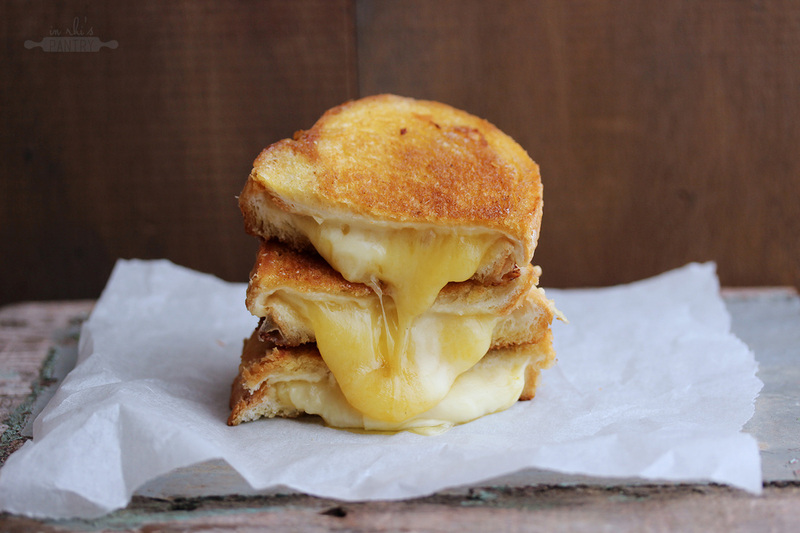 Not one, not two, but this grilled cheese uses three types of cheeses to give the perfect combo of flavour, texture and gooey-ness (not a real word but lets go with it). Pair that with a fresh, crusty loaf of white bread and good quality butter, you'll have the base to an amazing bite. 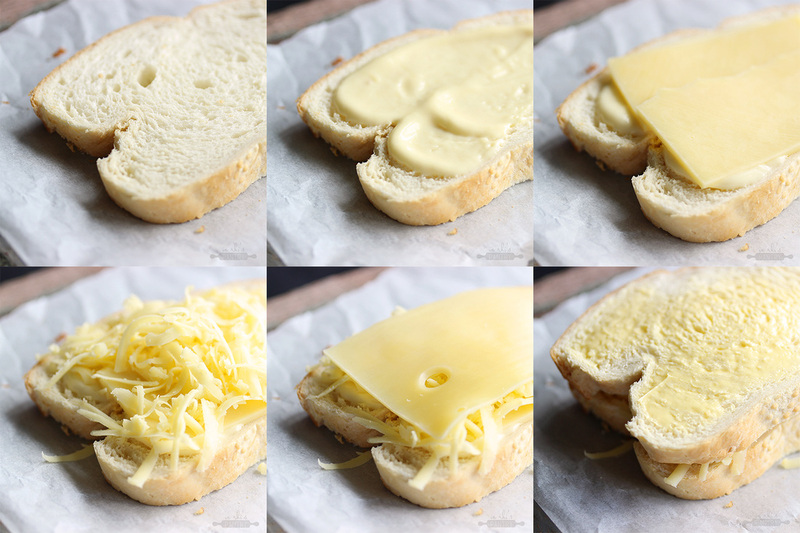 As you'll see in the little pictorial below, it's as simple as this - buttered bread, layer of cheesy white sauce spiked with a little mustard, slice of Colby, grated Cheddar, slice of Emmental, top with more sauce and bread. Fry. Hot. Delicious. Perfect. No joke, heaven. Warning: you will most definitely end up in a cheese induced food coma, and you'll love it. This is a must make for anyone with a savoury tooth! Enjoy! In a small pot, melt the butter over a low to medium heat. Once melted, whisk in the flour and stir for two minutes to allow the flour to cook out. While stirring, add the milk in 1/4 cup increments (note: the sauce will look dry with the first addition of milk, continue adding the milk while stirring until smooth). Once smooth and thickened, add the mustard and 1 cup of grated cheddar and stir until the cheese has melted. Slice your bread into 2cm thick slices, and butter one side. Turn over (butter side down) and spread with cheese sauce, then lay a slice of Colby cheese on top. Sprinkle with grated Cheddar and place a slice of Emmental on top. On the top slice of bread, spread again with cheese sauce and place on top of the Emmental cheese, butter side up. Heat a pan on a medium flame, then fry the sandwich on each side for around 3-5 minutes, or until the outer is golden and the filling is gooey. Leave to cool for a few minutes then enjoy!